Home > Tapes & Floor Markers > Construction Site Tape > Detectable Warning Tape > Caution rising main below tape. Caution gas pipe below tape. Caution non potable water below tape. Caution sewer pipe below tape. Caution traffic signal cable below tape. 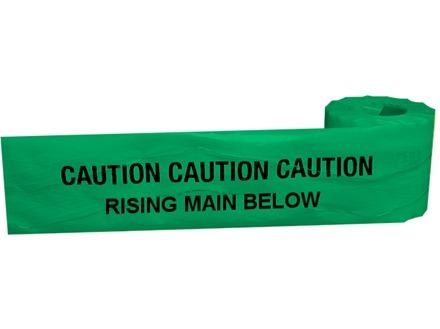 Caution rising main below tape. Detectable underground warning tape. 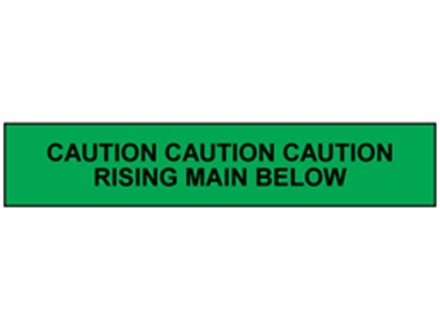 This rising main below tape is used to warn the workforce and the public of various dangers on the current area. Detectable underground warning tape. Caution rising main below. Waveywire, with stainless steel tracers, to identify the presence of buried cables, pipes, pipework, sewers and ductwork. Rot resistant. UDT018 Size 150mm x 100m. Material polythene. (Virgin low density grade, 50 micron thickness containing no PVC).